With three forms of premium grade protein (isolate, hydrolysed and concentrate), as well as a comprehensive amino acid profile, Precision Engineered Whey Protein Vanilla tastes great, and is the perfect choice for your training and fitness goals. Batch certified and quality assured via stringent testing. Derived from milk, Precision Engineered Whey Protein is a natural source of protein, and is ideal if you have an active lifestyle, or want to increase your protein intake. 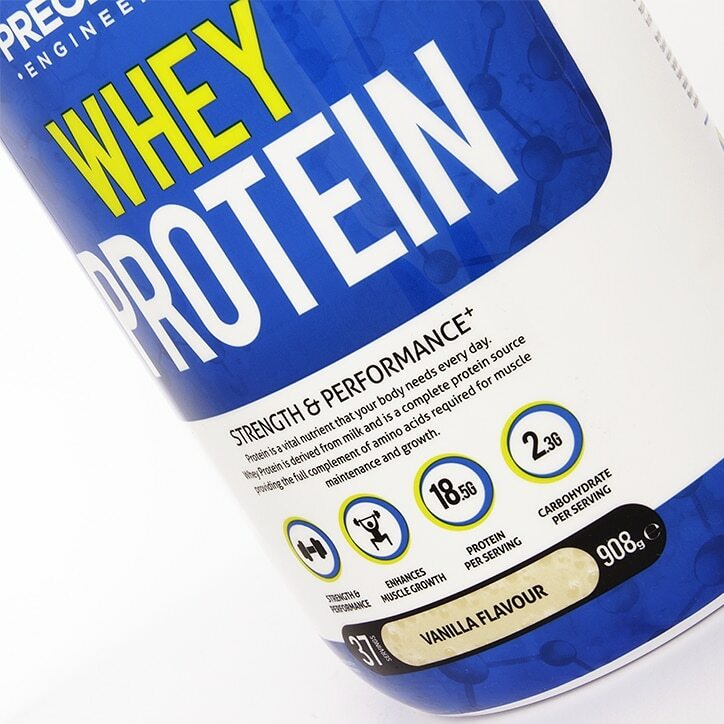 Precision Engineered Whey Protein is perfect post workout or in-between meals to keep your protein levels topped up. Protein Blend (Whey (Milk) Protein Concentrate (WPC80), Hydrolysed Whey (Milk) Protein, Whey (Milk) Protein Isolate), Maltodextrin, Emulsifier (Soya Lecithin, Acacia Gum), Cinnamon Powder (Maltodextrin, Corn Starch, Glycerol, Sucrose, Molasses, Cinnamon Flavouring), Starch. Sweetener (Sucralose), Vanilla Flavouring (Sulphites), Sucrose, Vegetable Oil, Lactoperoxidase (Milk), Vitamin C (as Sodium Ascorbate), Vitamin E (as dl-Alpha Tocopherol), Colour (Beta Carotene), Anti-Caking Agent (Silicon Dioxide). No Artificial Colours or Flavours. No Preservatives. No Gluten, No Wheat, No Yeast, No Fish, No Porcine. Contains (or contains an ingredient/s derived from) milk, soya and sulphites. Food supplements must not be used as a substitute for a varied and balanced diet and a healthy lifestyle. If you are pregnant, breastfeeding, taking any medication or under medical supervision, please consult a doctor or healthcare professional before use. Discontinue use and consult a doctor if adverse reactions occur. Not intended for use by persons under the age of 18. Phenylketonurics: Contains Phenylalanine. Amounts greater than 250mg daily of phosphorus may cause mild stomach upset in sensitive individuals. Keep out of reach of children. Store in a cool, dry place. Do not use if seal under cap is broken or missing. 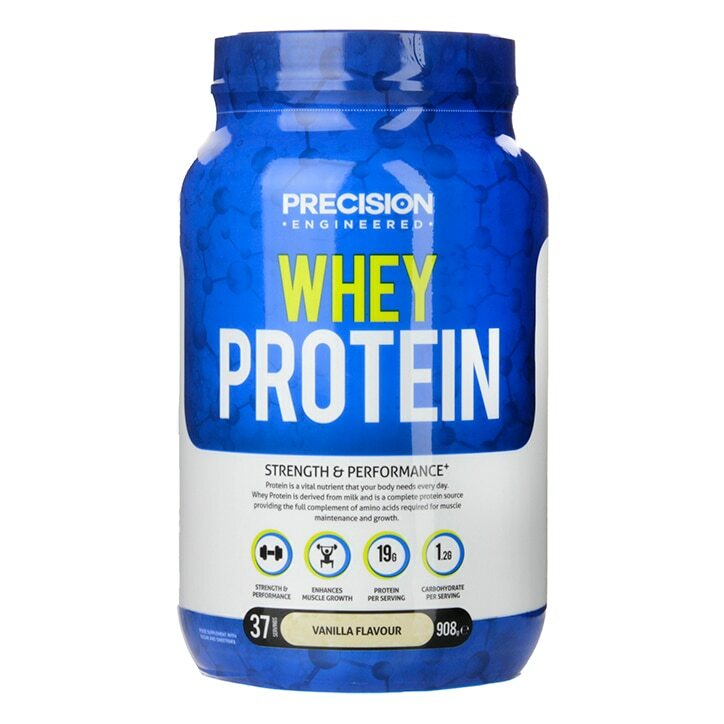 Precision Engineered Whey Protein Vanilla is rated 4.2 out of 5 by 141.